Organs such as stem, roots in plants made up of different kinds of tissues. A tissue is a group of cells with a common origin, structure and function.Their common origin means they are derived from the same layer of cells in the embryo. Being of a common origin, they are similar in structure and hence perform the same function. Many kinds of tissues organize to form an organ. Example: Parenchyma, collenchyma, xylem, and phloem are different tissues in plants. The study of tissues is called histology. Composed of immature or undifferentiated cells without intercellular spaces. The cells may be rounded, oval or polygonal; always living and thin walled. Each cell has abundant cytoplasm and prominent nuclei in it. Vacuoles may be small or absent. Meristematic tissues have the ability to divide, hence they continuously produced new cells which keep differentiating to form specialized cells of the plant. The cells at the root and shoot tip bring about an increase in the length of the plants. The cells in the lateral region i.e cabium bring about an increase in the girth (thickness) of the plant. Depending upon position of merismatic tissue in plant body, meristimatic tissues are of following types. 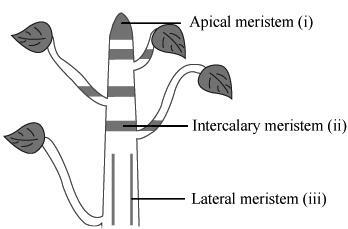 Lateral meristematic tissues: are present in the sides of stems and roots. They help to increase the girth of the stems and roots. Intercalary meristematic tissues: are present at the base of leaves and internodes and help in the growth of those parts. Permanent tissues are those in which growth has stopped either completely or for the time being. Cells of these tissues may be living or dead; and thin walled or thick walled. Thin walled permanent tissues are generally living whereas the thick walled tissues may be living or dead. Simple tissues: Simple tissue is made up of only one type of cells. Common simple tissues are parenchyma, collenchyma and sclerenchyma. Complex tissues: Complex tissue is made up of more than one type of cells working together as a unit. Common examples are xylem and phloem. 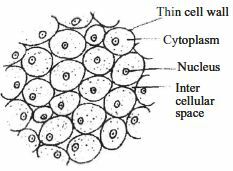 Individual cells are spherical or isodiametric (having equal diameters in all directions) – allows cells to be packed together very tightly. Often referred to as packing tissue because it makes up the bulk of tissue in the cortex of stems and roots and in the storage organs eg. potato tubers, where it is packed with starch. Cells are living with thin cellulose cell walls and are usually turgid – provides mechanical support for stems and roots. Retain ability to divide and can redifferentiate to form different cells. Following wounding, parenchyma cells can redifferentiate into meristematic cells, capable of producing new cells and tissue. May become specialised for particular functions. Chlorenchyma = parenchyma specialised for photosynthesis eg. palisade mesophyll cells with many chloroplasts. Aerenchyma = parenchyma specialised for gas exchange eg. spongy mesophyll and in aquatic plants, to provide buoyancy. Found just below epidermis in stems and petioles. Makes up the ridges in ridged stems and forms the stringy parts of celery. Provides a cylinder of flexible but strong tissue around the outside of the stem and petiole. This allows them to bend in the wind. The percentage of collenchyma in young stems increases as exposure to the wind increases. Tightly packed cells, with few if any air spaces but cell walls are unevenly thickened, having extra cellulose deposited in the corners – extra cellulose provides mechanical strength. Cells are living, i.e. non lignified – allows tissue to stretch and provides flexible support. Not found in roots – roots not exposed to wind so no need for flexible support. There are two types of sclerenchyma cell but both have rigid, lignified walls which cannot stretch. Fibres are long, narrow cells with thick lignified walls and narrow lumens. Their walls have simple pits. Their pointed, tapering ends overlap with the fibres are long, narrow cells with thick lignified walls and narrow lumens. Their walls have simple pits. Their pointed, tapering ends overlap with the fibres above and below them – provide mechanical strength and protection to non-growing regions. Fibres are found in xylem and phloem and form bundle caps in dicotyledon stems. In transverse section they form a cylinder of mechanically strong tissue around the perimeter of stems allowing stems to withstand lateral forces. Fibres are economically important – in ropes and fine linen etc. 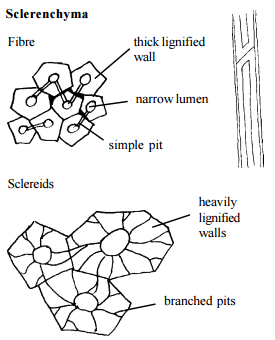 Sclereids are shorter and fatter than fibres but, like fibres, the cells have no living contents and have heavily lignified walls – provides mechanical strength. Sclereids may occur in isolation in the cortex, pith, xylem and phloem or may occur in groups in the testa of seeds eg. shell of walnut – provides protection against physical, chemical and biological agents and contributes to firmness of fruit tissues. Xylem and phloem form a continuous system inside the plants, that is from the roots through the stem and leaves. They are known as vascular tissues and form vascular bundles in roots and stems. Vessels consist of dead, hollow cells with wide lumens. Cells are linked end to end in a drainpipe. Vessels consist of dead, hollow cells with wide lumens. Cells are linked end to end in a drainpipe fashion. End walls have one or more perforations – allows rapid transport of large volumes of water from roots up through the stem. Vessels have thick lignified walls – prevents the cells collapsing, enabling them to withstand the negative pressures generated as water is pulled up through their lumens. Lignin also provides waterproofing. Side walls may have bordered pits (unlignified areas) – allows lateral movement of water. If, Side walls may have bordered pits (unlignified areas) – allows lateral movement of water. If for example, one xylem vessel becomes blocked, water moves sideways to another vessel and then upwards again. 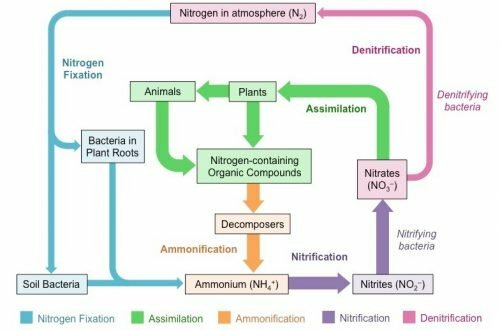 Vessels are the main conducting cells in angiosperms – Large leaf surface areas mean transpiration losses, hence water demand is very high. Large diameter vessels enable large volumes of water to be moved through the plant. Dead, hollow cells with narrower lumens than vessels. Tracheids are connected vertically to each other via bordered pits – Conduct water in conifers which, because they have needles, do not lose as much water as, for example, broadleaved trees. Narrower lumens encourages capillarity. Have tapering end walls which dovetail together and various patterns of lignified thickening – provides mechanical strength. Phloem too is a conducting tissue which conducts food synthesised in the leaves to different parts of the plant. 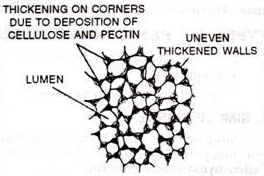 Cytoplasm of sieve tube element is thin and peripheral. Few organelles, no nucleus – so flow of solutes, not impeded. Cellulose cell walls – allows exchange of substances across them. Each sieve tube element is directly connected via strands of cytoplasm known as plasmodesmata to its own companion cell. The companion cell controls movement of solutes in the sieve tube element. Plasmodesmata allow exchange of substances between the sieve tube element and the companion cell. Dense cytoplasm. Has nucleus and abundant other organelles e.g. ribosomes, mitochondria and Golgi body – Nucleus control activities of sieve tube element. Ribosomes allow production of enzymes and carriers. Mitochondria produce ATP for active transport in the sieve tube element. Provide support and some protection for delicate sieve tube elements.